It has been a journey of sorts ever since - undertaken to rediscover the self, redeem faith, redefine music, recreate every beat and most important of all, to rebel. The significance of being a traveller here isthat one ends up being a bohemian as well, "It isn't following but making and even breaking one’s own ideologies, trends, rules, conventions…just the way doing rap in Punjabi helps me establish the meaning of being bohemian. It goes far beyond the literal meaning," asserts Bohemia, the renowned Punjabi rap star from California as he spells out the reason behind his name. He is in town to promote his latest album, Da Rap Star. 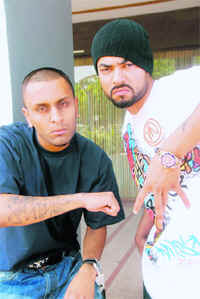 If Bohemia's name was the topic of discussion for some time, even his rap partner J Hind's was. With tattoos of Mahatma Gandhi, Subhash Chandra Bose and Shaheed Bhagat Singh on his arm and a name like that, we guessed the strong patriotic streak in him, which he affirms, "Just like any Indian, I love my country too." J Hind feels in the USA, this all helps him to prove how great is India, "These symbols make me feel as the representative of my country, and its history and culture." Every decision of his life till now proves him to be one, "Choosing Punjabi for the lyrics of my songs helped me express my views better. And choosing rap, a music genre devoid of melody, of any layers that can hide shortcomings in a singer's talent or compositions, helped me be honest and perform my best." For him definition of rap music is, "A music without pretense, where all that matters is voice and lyrics. A music which is bohemian and, in all senses, is me." Now that's Bohemia! With this perception, it was natural for him to compose music and pen down lyrics himself. But there was another reason too, "It made me stick to my culture. I don't deny being 'Americanised' but I inherit a background that I cannot forget. Singing desi rap connects me and even people from this subcontinent to their roots." The popularity of his albums, Vich Pardesan De and Paisa Nasha Pyar bears a testimony to the fact. Of late, among thousands of fans across the world, he found one in Akshay Kumar and vice versa, "He is a great actor and a person for he is the one making efforts to rope in international stars and take Bollywood to people in the West. I was awed by his humility when he requested me to sing for his movie". However, the flicks’ failing at the box office hasn't changed his opinion, "Akshay doesn't believe in adhering to the tested success formulae. He keeps on experimenting with his movies and every experiment does not end up in an invention. With time, things will eventually work out." Having sung rap songs for Akshay's film Chandni Chowk to China, 8X10 Tasveer and a rap number in Priyadarshan's upcoming flick, De Dana Dan, he is all set to do more Bollywood projects. His life history too reflects a rebel's streak in him, "While in tenth standard when my brother and friends used to play out, I preferred to listen to Kishore Kumar, Mohammed Rafi, learn harmonium and read poetry by Mirza Ghalib", he goes on to recite his favourite couplet, Hazaron khawishen aisi…. Born in Pakistan as David Roger, he moved to the USA when he was 12, thus it was natural for him to get influenced by the western and eastern music genres, "I loved listening to the old Indian music and liked the style of rap music. That formed the genesis of my becoming a music lover." And then the amalgamation happened. After having achieved a lot, he still aims to remain focused on his ultimate goal, "I will always strive to be original just the way Nusrat Fateh Ali Khan was at sufi, Gurdas Mann and Malkit Singh are in Punjabi, Jagjit Singh in ghazals, Lata Mangeshkar in Hindi music and Eminem is in rapping. Wish Bohemia would be the original in desi rap!" A round of rallies, padyatras and press conferences are not enough for politicians. They need someone who can polish up their image and sell it 'smartly,' such that it is bought by all and sundry. Enter, the public relations (PR) professionals, experts in packaging and marketing. This time, the politicians have taken a new route to image- building---PR professionals, who can source them with innovative ideas for campaigning, equip them with the facts, spruce up their lifestyle (for a given period) and market them as the most trusted brand. The tricity has a number of PR professionals doing the needful for their netas. Says P.K. Khurana, who works in coordination with Kehar Singh Koundel, Davesh Moudgil and Dheeraj Jain to give a positive spin to Satya Pal Jain's image. From framing press releases, organising press conferences, to guiding them on what to say, what not to say, what issues to focus on, these people take care of the 'political branding' of the leader. "In earlier days, a marriage in the family would keep all members on their toes. Now, people hire caterers to facilitate marriage preparations. In the same way, PROs help to make the politicians' work easier, so that they can concentrate on important issues, rather than drafting releases or taking calls," he says. Now, what does this strategy planning encompass. "It includes a complete media training programme, sending SMSes, direct mails, working on jingles, video and audio CDs, advising them on issues, guiding them on what they should wear, how they need to carry themselves in public and at press conferences," offers Khurana. He explains further, "We have regular brainstorming sessions, where we come up with ideas and then unanimously decide on the feasible ones. This time, we have come up with a slogan: Dil ki suniye, Bhajpa chuniye. In addition to this, we have companies who send regular SMSes on behalf of the party candidate, giving information on anything new on the blog, or sending greetings on a festive occasion." Of the numerous things that they need to work on, improving the brand image is their main task. Vineet and Navnit Joshi from Trivani Media, who are working for a good number of SAD-BJP candidates, say, "Our work can be defined as a third-party endorsement programme, wherein we take care of umpteen things, in order to promote the positive image of the leader and the party," offers the duo. They focus and work on the word 'innovation.' We come up with wacky, out-of -the box ways to woo the voters. For instance, we will send a message through kite flying and parachute, wherein leaders will appeal to the public through these props. The two also feel that the role of PR professionals in political brand building is growing. "A well-drafted publicity campaign can do a lot of benefit to the leader," remarks Navnit. There is no way that politicians can ignore the role of their image builders, for everyone wants to sell an absolutely neat image. Priyanka, who looks after RJD candidate Haffiz Anwar-Ul-Haq's PR, defines it as a confidence-building exercise. "My job is to work on the strengths of my client, such that the voters take a liking to him," says Priyanka. At the same time, she also feels that the major challenge is to beat old, repetitive ideas. " I have to think differently from the rest, as this will reflect on my leader's image. What challenges do these professionals face? Narvijay Yadav of Specttrum PR, who is working for the BSP candidate, Harmohan Dhawan, finds getting the 'right media coverage' a challenge. Bollywood doesn't shy away from experimenting and filmmakers are always game to bring about changes in the industry to yield better results. After multi-starrers and director duos, hiring multiple composers for one movie is the latest trend in filmdom. Recent releases like Firaaq, Aloo Chaat, Aa Dekhen Zara, Raaz - The Mystery Continues, Golmaal Returns, 8x10 Tasveer and Sikandar among others had multiple composers for their soundtrack. "There are different situations in a film and each situation demands a different genre of music. The composers today are not as dynamic as yesteryears music directors like Shanker-Jaikishan, S.D. Burman and R.D. Burman. So in order to have different melodies for diverse scenes, different composers are roped in," Mukesh Bhatt, producer of Raaz..., said. "More composers add different flavours to the album," added Bhatt, who roped in Raju Singh, Sharib Sabri, Toshi Sabri, Gourov Dasgupta and Pranay M. Rijia to create music for his hit thriller. But Piyush Jha, director of Sikandar, said that bringing in more than one music director for a project doesn't mean that a filmmaker doubts any composer's capability. "It's not that a composer is not capable of giving good music and that's why you sign more music directors. It is just that like one lyricist has a different thought process and approach from the other, similarly all composers have particular styles as their forte," said Jha, who has earlier made films like The King of Bollywood and Chalo America. "Also there is no harm to try various composers for your film. Different people bring different inspirations to a film, like all actors bring varied energies to the project. Its a good trend that adds freshness," he added. While filmmakers rope in more than one composer to give their movie and added flavour, some composers too feel that working with others for the same soundtrack helps in churning out a healthy cocktail of songs. "Working with other composers for a film definitely helps since everyone gives their ideas and their inputs towards the music of the film. This helps make the soundtrack better," said Uday of composer duo Justin-Uday. In such an arrangement, is their scope for creative freedom? "There is no confinement. Everyone knows what to do and works according to that. There is no overlapping," said Sharib, one of the composers of Raaz 2. Uday also said there was no problem working with other composers. "When you work with others on a film, you get ample creative freedom and breathing space. This is never a problem as such. As long as you are getting the credit of what you have done, there is no problem," he said. But there are some who don't believe in this concept at all. "We don't do multiple-composer films. We are willing to be part of only OST (original soundtrack) compilations, where we retain full ownership of our songs," said Vishal Dadlani of composer duo Vishal-Shekhar. She may no longer be the face of brands like Coca-Cola and Nakshatra diamond jewellery in India, but Aishwarya Rai is still riding high on successful and long-standing international endorsements. Aishwarya has completed nearly a decade of endorsing Swiss luxury watch brand Longines and international soap Lux. She has also been the brand ambassador of global haircare brand L'Oreal since 2003. Noted ad-man Prahlad Kakkar says Aishwarya is sought by well-known brands because she is more than just an actor and is often perceived as an ambassador of India. "Aishwarya was never a big or major endorser of Indian products. She has an impressive list of international brands to her name and that's because she is not just an actor who can be judged on hits and flops, but the fact that she is a representative of the Indian woman and is an ambassador of the country," Kakkar, who made her famous as Sanju in a 1993 TV commercial for Pepsi, told said. Even representatives of the brands that Aishwarya endorses feel she adds a new dimension to their products. "Aishwarya has been associated with us since 1999 and it is a big help. Not only in this country but also globally," Charles Villoz, vice president (sales) of Longines International, had earlier said. "People across the world love Bollywood films and they go housefull. Wherever we have travelled (with Aishwarya) the response has been overwhelming. She is a global face and we would like to continue this association as long as possible," Villoz said. For Aishwarya, who has made her presence felt internationally through English language films like Bride and Prejudice, Mistress of Spices, Provoked and Pink Panther 2, signing films and endorsements has been a very selective affair. When she was approached to promote L'Oreal's skin whitening cream, the beauty queen-turned-actor refused as she didn't want to endorse such a product especially in India, where one's skin colour is an issue, said a source close to Aishwarya. "Whether it is films or endorsements, I am - and have been - very selective about my work. I take up work which suits me and fits in my schedule," Aishwarya had said earlier. "I don't take projects that I cannot handle because I believe in totally fulfilling the commitments made by me," she added. Bollywood actor Mallika Sherawat joined the league of Hollywood celebs including Kim Kardashian, Miley Cyrus, Victoris Beckham, David Beckham and Paris Hilton, after a Hollywood milkshake was named after her. Mallika, who visited Millions of Milkshakes in West Hollywood, has been honored with her very own milkshake called the Mallika shake, reports Contactmusic. The Mallika shake includes blueberries, raspberries, blackberries, strawberries, and chocolate sauce. To make the shake more appealing, it has been topped with whipped cream. Actor-director Rohit Roy is all set to step into Amitabh Bachchan's shoes for the Bengali adaptation of 1973 hit film Abhimaan, best remembered for its songs like Teri bindiya re and superlative performances by the Big B and Jaya Bachchan. "I'm doing a major project called Pa Ma Ga Re Sa, which is a modern musical love story. It will be my first Bengali film and it is special because it is based on Abhimaan. It is basically an adaptation of the film," Rohit said. "The film has Gauri Karnik, who was seen in Sur before. And former Miss India (Earth) Reshmi Ghosh will be seen as the other woman. It is being directed by Surajit Dhar," he added. The first schedule of the film has already been shot and Rohit, who has recently stepped in as the host of the third season of TV dance reality show Jhalak Dikkhla Jaa, will soon head to Kolkata to shoot a few more scenes of it. 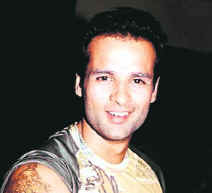 Rohit has joined Jhalak... midway and is co-hosting the show with TV actor Shweta Tiwari. "This show is very close to my heart. I watched the first season, hosted the second and now I'm hosting the third mid-way. I think even the producers have grown to like me and I'm really excited to be back on the host's seat," he said. On the Bollywood front, the actor has a bouquet of films like Mittal Vs Mittal, Apartment and Alibaug in his kitty. And the actor, who had made his first stint with the arclights with popular TV show Swabhimaan, is excited about essaying different roles in each of these movies. In 'Mittal Vs Mittal, I'm playing an abusive husband to Rituparna Sengupta, in Jagmohan Mundra's Apartment, I'm playing a very jovial, guy-next-door sort of a role and in Alibaug, my role is of a doctor who cheats on his wife. As an actor, I can't draw a line and decide a set kind of roles that I want to do, I have to be diverse and I am enjoying doing it," said Rohit, who also featured in hit film Shootout At Lokhandwala. Besides this, he is also toying with the idea of scripting his next directorial venture, which will be a remake of Basu Chatterjee's 1981 classic Shaukeen. Chatterjee's film, about the adventures of three old men in Goa, starred Ashok Kumar, Utpal Dutt and A.K. Hangal, but Rohit's "grand wish list" for the cast of his "glamorous" version of the film includes Rishi Kapoor, Naseeruddin Shah and Boman Irani. "We are trying to finish the scripting of this mad comedy. Though the idea of the film will be based on Shaukeen, the reason for their adventures would change and the setting would be more glamorous - maybe they would go to Las Vegas instead of Goa. The only tryst with anything remotely close to 'farming' or need we say 'planting', Gaurav Sahai ever hadwas potted plants at his home. As we know, sooner or later, things you have your heart in, do come to your corner of the world. For Gaurav, it came in the form of a 'satisfying and experimental happening', and he named it Sattva. Before he digs into his 'heart’s calling', he cheerfully gives a low down on the process behind it, in a fast forward mode. "I have lived with this guilt of using too much paper and wood for our lifestyle," says Gaurav, who has enjoyed his share of swanky offices, travel, time- pressed living of the corporate world (He's done his business management from US). In the series on incidents happening in his life, he happened to read how Mahatma Gandhi managed to provide a self-contained set up through two farms, where people lived in equilibrium with the nature. "Bang on, something I wanted to do," Gaurav puts in. And without getting into the ifs and buts of the this self- proposition, farming, Gaurav went ahead to plant community trees for a park in Panchkula. From here he graduated to planting just about everything 'organically' on one of his friends farm in Landara. "Now, I know this where my heart was," he flashes a contended smile. Gaurav and his wife Vandana Babbar grow almost all kinds of seasonal vegetables, winter and summer, pulses, fruits, exotic veggies such as broccoli, cherry tomatoes, celery on the farm. The produce is free from the use of chemical fertilizers and pesticides. Sounds healthy? But, the behind the scene, it was a story of challenges, tough grind, uncertainty and skepticism. "The first season was a beautiful disaster," smiles Gaurav. "What made it so was unskilled labour, absence of good organic produce, pests, weeds, getting a good produce with the minimum use of machines, no labour for home delivery, little information on organic farming on Internet … loads of other things." "I don't peep too much in the future," he offers, "we are still taking each day as it comes." Presently Gaurav, grows the organic stuff on 2 acres of land, which can feed 30 families. On Sattva? "It's a community of people who want to eat healthy. Anyone who wants to fall in this league can be part of Sattva through farmsattva@gmail.com. Here, we will provide an assortment of organic veggies, fruits, pulses at your doorstep as per your demand and choice, explains Gaurav, who also feels that mandi's do not give the true of the produce to both farmers and buyers. "I can also sell the produce at mandis, but I don't want to do so, because, I want people to know who is growing the organic produce for them. I will also want to know where the stuff is going. And for this, we ask our members and others to come to the farm, see what we are doing, plant seeds, having a good time with kids and go back thinking healthy." When some heavy-duty medical jargon; epidermis, stratum germinatum trans epidermal water, stratum corneum, microbes, glands etc etc enter the lecture dais, don't automatically believe it's anatomy! Neither a class on immunology nor a thesis presentation on tissue culture. The hospitality industry aspirants at Flying Cats-8, are out to study the basics of grooming-skin and hair care. "They need to be taught the technical aspect also, like how the formation of skin takes place to help them know better," clears out Esther Kinder, Keune expert, Holland based academy. While the physiotherapist by profession is busy telling students the finer nuances of skin, there's just enough time to catch up with Wasim Ahmed, technical educator, here for the one-day session too. "I'll be teaching them what hairstyles to follow, the problems, how to take care on a regular basis, maintain them, of course followed by the practical," he says. A lot actually goes into deciding that perfect hairstyle, beyond the obvious eyes, ears and aesthetics of the face. "While deciding hairstyle for a person we keep in mind the profession, the personality, over all structure," he says while agreeing, the grooming is not a one-day affair. "Whatever we'll be teaching them, needs to be incorporated. There's a difference between tips and practice, the earlier can be given in a few hours while the latter needs to be continual process," he signs off not before busting 'the myth' amongst Indian women. "Too much of henna is not good, it dries your hair, it's a fixation in this country and not one stop solution to all the problems." Meanwhile, the students in the adjoining hall are just as they were left- all eyes and ears. This time, they've reached the circular motion in which products need be applied on face. Boys in tow too, with creams on their faces! "When it comes to hair, simplest of shampooing and conditioning is the key to best looking hair," advises Esther. "Have you ever seen a painter at work? He doesn't straightaway start painting, without first working on the base and making the surface ready for coat." The tried tested since granny's era formula of cleansing, toning and moisturising is still going strong. "They are essential and astonishing, apart from this apply rose water twice a day, once in morning and see the difference." Let's see. Panorama '09, an event at the Government Art Gallery and Museum-10 was all about children with special needs. An initiative to explore and enhance their potential the event consisted of a mélange of events that helped the children to exhibit their creativity and innovation. An event with a difference, it catered to a special audience and set out to provide a unique experience to the special children, which included the visually impaired, deaf, mute and the underprivileged. Da Milano, the luxury brand, has launched its luggage collection 2009. Crafted from the finest Italian leather, the luggage collection comprises of leather strolleys, overnight bags, travel handbags, passport cases and toilet bags. An essential wardrobe accessory; this collection of sophisticated travel accessories convey polish, finesse and subtle luxury. Da Milano's collection of travel luggage and strolleys is immaculately designed and detailed to perfection. The luggage is crafted from smooth textured Italian leather that has a subtle sheen. Fashionable, functional and sturdy, the travel gear is designed with multiple pockets and compartments to store all you're essentials. This enviable collection is a must have for all those who want to flaunt their luggage this holiday season! So whether on a luxury vacation at your favorite ski resort or cruising down the Mediterranean, the collection is an ideal travel companion. Versatile and unisex, the collection is designed for fashionable men and woman. The collection showcases vibrant spring-summer colours ranging from burgundy, mustard, olive, royal blue, white, grey, beige, black to brown. Make up moves towards a natural look. The dewy look is in for the younger lot, light tinted moisturizers finding favour, rather than foundation, both for day and night, with less shine for the night. Heavy foundations and shine on the face are definitely out. Look for a matte finish on the skin, if you want to be in. The aim is to project a sheer skin texture. Eye make-up trends favour less mascara and coloured eye pencils for lining the eyes, like browns, burgundy and purple, with a smudged and smoky look. No harsh lines. Or go for colourful shadow at the lash line. For eye-shadow too, purple tones are becoming popular - like lilac, mauve and purple itself. Full, brushed up eyebrows find favour. Eye make-up is heavier. Eye liner is thicker on upper eye lids and extended outwards and slightly upwards. The eyeliner is thicker in the middle of the eye, like the 70s look. For the lower eyelids, a lighter effect is in, using eyeliner and then smudging it with a little shadow. Frosted sheen, gloss, or shimmer, stay popular for the lips. Lip liners match the lipstick -no obvious darker outline around lips, as in the past. In other words, the "lip-lined" look is out. Red and shades of red have made a comeback and will stay in vogue in lipsticks. Shades of red, like cherry, rose, plum and red itself are in fashion for the night. Lilac, mauve, soft pinks and rose find favour for the day. Orange is out. For the night, specially gala nights, bright metallic colours and glamorous lips are in. As for nails, pinks will be out and dark colours will be in, like burgundy and chocolate brown. Mineral make-up has been in during recent times. It is based on loose powder, which does not contain perfume, alcohol, mineral oil, dyes, etc. The texture of mineral make-up is lighter, so it gives the skin a translucent quality, instead of a heavily made up look. 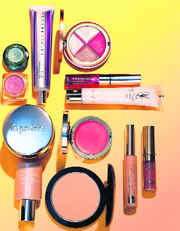 The ingredients in mineral make-up are said to have sun-protective benefits too, apart from nourishing the skin. We have used 24 Carat pure gold in our Pot of Gold Foundation, which gives the skin a natural golden glow. Many of the minerals used in mineral make-up, like zinc oxide, are said to have healing benefits too. Gold, for instance, rejuvenates the skin and protects from oxidation damage. The main trend that is influencing beauty is the view that looking beautiful is not just a matter of make-up, hairstyle or trendy clothes; fitness too plays an important role. Beauty care in coming years will strive for a radiance that comes from sheer good health, with energy, vitality, a slim and supple body and self-confidence. The key to beauty will be "feeling good and looking great." No flowery words, no jingles, jazzy introduction, impressive preface, catch lines, attention-grabbing gimmicks, nothing doing. When you write for causes, words fall short, inapt, perhaps this anecdote pulled out from the website of one of the NGOs itself might help. A man, once walking by the beach, sees starfish washed ashore. Fearing they'd die on being exposed to first rays of sunlight, he picks them all up and starts throwing them back into the sea. Another man passing by asks the logic behind his endeavour, 'What difference does it make? There are millions of starfish, how many would you save?' The previous man picks up yet another, takes two steps, flungs the star fish back into the sea and says, 'It makes a difference to this one'. If you thought that was all we had, here's a dose on the other active social groups that are making a statement with their cause camaraderie. Mitra, a social group from UIET, actively came out to support the recent Earth Hour celebrations. It has been around for long and well, managed funds through a rather fun-way, like tambola games and organising cultural events. Their name spells it! And puts their purpose and nature beyond obvious. Anyways, Youth United, a student NGO formed in 2006, already brags of 50 active members, 100 volunteers, two chapters; Chandigarh, Delhi with one in Patiala soon to be opened. They don't come without their share of problems, "Frankly speaking, funds are a problem. We have a very hand to mouth existence, but for each event we somehow manage," says Saloni Bajaj, vice president Youth United. Their latest effort, Smiling Future, focuses on kids from underprivileged background. "In one of the events, we had thousand forms filled from houses in Colony no. 5, talking of several problems. Drugs and education came out to be the biggest one." She adds, "Right now we are focusing on the NGO part of the organisation." Focusing also includes picking up stumbling blocks spread in the way. "Apart from the paucity of funds, there's not much support from the administration. But yes, Chandigarh Police has been very supportive." Why don't you go; add to their list of supporters? BIMAD- it isn't just some fancy nomenclature for a group of idealistic youngsters. Every alphabet counts; 'because I make a difference' came into being for exactly the same reasons and of course the madness to route out wrong. "We were a group of vella college people, would discuss flaws in society. While everybody wants change, how many themselves be the change," questions Garima Bhayana of U.I.E.T. The student initiative of 8-10 founder members is the newest on the block; registered as late as May last. The non-profit, self funded registered as a Society organisation's not limited to a single cause. "We work on diverse issues, it could be eve-teasing, environment, not wasting water…" she clears the air. No wonder, the projects take them to schools, colleges, wherever, but the 1800 strong volunteer team's not been a smooth sailing. "Funds are a problem, at the end of the day you need fuel to run your car. We do not have dearth of ideas, but even after running there's been no sponsors," apprises Jaskaran Singh Arora, 3rd year U.I.E.T student, founder member, and the mind who came up with the name. He recalls, "Once we had to put stickers, 'Please switch off the tap, it doesn't take long' above taps at public places, but we did not get permission from the MC on the grounds of defacement." In the meantime, the guys have things in place to ensure continuity, "When we got together, we made sure a lot of first year people joined us, so by the time we pass out and they get to take the reins." Live long! Not that there weren't tree plantations drive, 'don't waste water' kinda campaigns happening earlier, but the need to improve environment with a 360 degree approach catalyzed the dawn of Environment Saviors. "We wanted to do something about the environment, same time not restrict our activities and take a holistic approach to problems," says Brhamesh Alipuria, from UIET. "We took up Earth Hour project wherein we publicised on the net, spread awareness about the issue, involved media." The eight-member organisation though has not been formally launched but is open to volunteers. "Our exams are on, so our next project's going to be on paper management," he adds. Here's a student initiative that started on the concept of think global, act local and giving a meaning to it. AIESEC, an entirely student managed organisation, has amalgamated corporate and social responsibility into one. "We have diversified our work into three core areas- corporate development, public development and education," says Akkriti Bhatt, vice president, communications and information management. Their burning issues? "We have undertaken various projects like Genesis and ASK in HIV AIDS programme, Footprints for child rights, Pragati in rural and community development, Project Conserve on environmental issues. Our corporate projects include Eureka and Pheonix," she adds. To fight global issues, they send volunteers to work with NGO's in various countries through our exchange programme. The age of the organisation almost similar to age of its current oldest member, say 23, it cashes on the most powerful resource ever- youth. Like most of them, money doesn't look like a problem. "We partner over 3000 organisations globally that includes names like UNESCO, WHO, ABN AMRO. We send interns and volunteers through our exchange programme to work with corporates, NGO's and schools across 91 countries," says Akkriti. Joining them are the inspired young souls with a passion for serving from 850 universities around the globe. The local chapter has around 60 people in Chandigarh and 14 local committees across India. From street activities to organising auction dinners, these guys sure know how to brand their cause. And it's not all work and no play. The general body meetings over coffee or a cool resort in Shimla mean fun too. "It's important to keep our youthful energies inspired," says our young comrade. Started in 2007, this organisation is more or less one-man army. The goal was to associate young people with the idea of democracy, "We want them to know that they have an option when it comes to running the country and that option is them," says Anurag Chauhan, professional advocate and the founder member of the organisation. The core work highlights the loopholes in the system, be it then Panjab University, remember last year's illegal felling of trees in PU, this man went to jail in protest, or the creating a political awareness. "People should first know their rights and then demand their fulfillment," he says. He describes the Indian mindset through these words, "We want a Bhagat Singh to be born again, but in our neighbour's house and not ours," he says. "We have no right to criticize policies when we ourselves are not doing anything about them. "It's not easy to wake people up, though," he adds. "It needs a lot of inspiration, time and manpower and money too." so just like the inspiration and the spirit, money too is self generated, through events and campaigns. "The day we stop escaping from issues, I would think we have broken the ice." His has a straight funda of believing in one's effort and not depending on others to change the world for you. "People think you are mad, and one wants to get mad with you, so they don't want to be a part of the process. But the day we start escaping form issues, we will break the ice between us and the change," he says. His future plans include a 24/7 public helpline that will bail you out from the red tapist culture. Amen! We know them as the determined bunch that changed the face of Student Center, the heart of all the campus activity. Their weapon, a broomstick, and their passion to 'clean up' things and the society, inspired many and made a breakthrough by changing mindsets. But just when things looked inspired enough, Sankalp suddenly made the disappearing act. Wonder why? 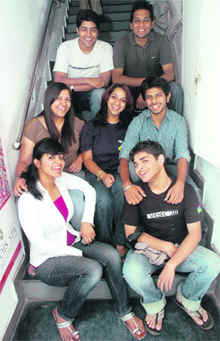 "Well, when we started three years back, we were a group of freshers, hoping to make a difference. 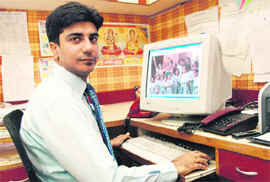 But then for while now our studies have taken priority," says Nitin, founder member of Sankalp. But their hibernation doesn't mean that social service has taken a backseat. " We are planning to get back together once our academic pressure gets over," he adds. Have a heart, got the will. Think and take your pick. Security and night food street (once again in news for all the wrong reasons) don't seem to gel very well. But this while, it was a parking clash amongst the gang of guys. We ask city youngsters, do they feel secure at the night food street? What can be done to prevent any untoward incident? I've been there only twice and it was a good experience. About this particular clash I'm not aware. But yes, the place does not come without its share of problems. It's very congested and they should make it more open. All the clashes and security problems mainly arise because there are a lot of drunkards loitering about the place. It should be banned for those sloshed out. I’ve been to food street, but never been there after seven or eight at night. When it comes to safety and security, nothing is safe, one needs to be careful themselves, moreover it all depends on the situation. The fact, that a lot of young college goers who are out merry making and at times, out of control is a major factor. Besides there should be cameras, PCR vans moving about to keep mischievous elements at bay. Shagun Sharma, Political science student, Panjab University. It's more of student crowd at the night food street, from the university and the nearby DAV College. Moreover, around night there are drunkards dotting the area. The nature and location of the place are such that one should expect troubles. We all know, it’s not the decent demure sorts who are likely to be found there, the straight simple crowd tucks up in the bed by nine. The reveller gang goes out of control, many a times. There ought to be more PCR vans or an active beat box nearby.